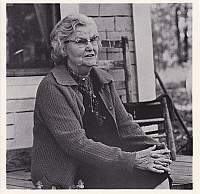 Almeda "Granny" Riddle was born and raised in Cleburne County, Arkansas, the fifth of eight children. Her father, a timber worker of English and Irish descent, was a prodigious singer and a singing teacher, and Almeda started her singing at a very early age. She learned most of her songs from her family and neighbors, developing a large repertory of songs which she tries to sing just as she originally learned them. 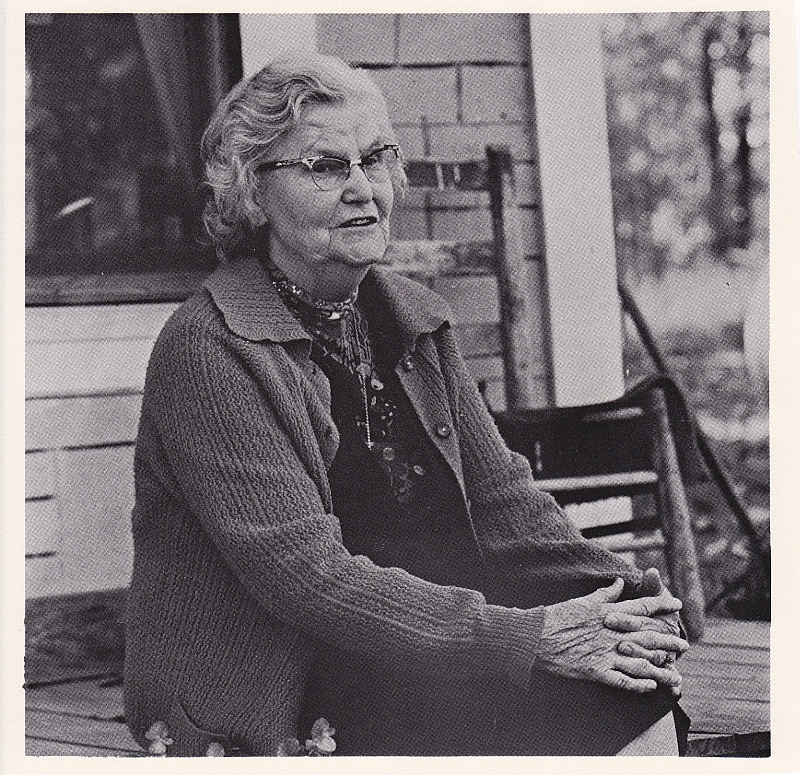 Her singing style is strong and clear, her voice is rustic, and her subtle ornamentation makes wide use of the little yodel that is typical of much music in the southern United States. Now [in 1977], at 79 years of age, Almeda Riddle is one of the finest traditional singers in America today. The song about the wedding of a frog and a mouse goes back at least to the 16th century. It is one of the songs sung in Wedderburn's Complaint of Scotland (1549), and it appears on a broadside as early as 1580. The theme is widespread throughout America and Britain, and an early version was probably a political satire against Queen Elizabeth l. Almeda learned the song at age 7 from her uncle, Bill Wilkerson. She believes that this version originally came from Ireland. More properly called "Bingen on the Rhine", this poem by the Hon. Mrs. Caroline E. Norton (Lady Maxwell) was typical of the sentimental poetry so popular in the mid-nineteenth century. Although written in England, the poem was widely anthologized in America, and set to music many time between 1840 and 1870 (one setting by Judson I. Hutchison was sung widely by Jesse of the Singing Hutchisons). The song enjoyed fairly widespread popularity in the South and appears in several collections. Almeda learned it from her father-in-law, R.W. Riddle in 1918. In one form or another, the broadside of The Unfortunate Rake is known almost everywhere in the English speaking world. in America it is known best as Streets of Laredo or St. James Infirmary. The first version Almeda learned was the Young Trooper Cut Down in His Prime, but probably because the young man died of a venereal disease Almeda's mother would not let her sing that version in the house. Later she learned Tom Sherman's Bar Room which her mother found acceptable. Almeda first heard this popular hymn at an early age, and it is still sung in the Primitive Baptist Church of which she is a member' Almeda's repertory contains well over 200 songs of which about half are hymns. Most of these, including Poor Wayfaring Stranger, appear in the Sacred Harp and other shape-note hymn books compiled in the mid 1800's. The tunes of these hymns are also often found in secular settings. This is one of the most widespread of all the ballads that Francis Child considered in his collection. It has been in print hundred of times and may be the most widely recorded ballad in the English-speaking world. Almeda learned this version as a young girl from her friend and neighbor, Aunt Fanny Barber, who named her own daughter Barbara, after the song. This is the f first time that Almeda's version has been recorded. Almeda is not certain from whom she learned this song. Possibly it was from her father's uncle, Hi James, who spent part of his life as a cowboy in Texas. The song is fairly wide spread in the South and is sung to a great variety of tunes. The tune Almeda uses is related to Come All Ye Tramps and Hawkers and certain versions of Peter Emberly. The tune is considerably more widespread than the ballad itself. Almeda rarely, if ever, sings this song in public. This song is also well known in America and appears occasionally in hymnals. Almeda's text is somewhat unusual. Most versions end with the death of the girl or go into more detail about her reception in heaven. In others, the rich man discovers that the child is his niece. The recorded text also differs somewhat from that recorded by Roger Abrahams in his book on Almeda: A Singer and Her Songs (a book to which I am much indebted). George Pullen Jackson says that the tune is derived from the Scottish song the Braes o'Balquidder. Almeda learned this song from an "old neighbor lady that I just loved, Aunt Sally Bittle". It is one of Almeda's favorite songs. Like Poor Wayfaring Stranger, this is another song from the Primitive Baptist hymnals that Almeda loved and sang "as long as I remember." Almeda's tune is found in Sacred Harp under the name: "King of Peace", but the words are different. The text appears to several tunes including "Warfare" and "The Marcellas". Jackson gives eleven verses to the song. I know of no previous recording of it. Coming to America early in its history, this British broadside about a young man who murders the girl he made pregnant is one of the most widely sung stories in North America, where it takes many forms from The Cruel Ship's Carpenter to Pretty Polly . It is also well known in England, Ireland and Scotland as it was a widely published broadside. One of the oldest existing versions is The Berkshire Tragedy an 18th century broadside in the Roxburghe collection. Almeda learned the song from her husband-to-be H.P. Riddle when she was 15 and he was 16. They married when she was 18 but he was killed, along with her baby, ten years later in a cyclone (1926), leaving her alone to raise the three surviving children. Almeda dislikes the song because "It's too bloody" and has never previously recorded it. Almeda's sprightly version of this lyrical lament makes for a perfect ending to this album. This song, with its British counterpart I Wish, I Wish, represents one branch of a huge family of songs originally deriving from the Scottish ballad, Jamie Douglas (Child 204). It is sometimes called Waly Waly after a line in a first verse which Almeda does not sing. to top of page ... Return to Minstrel Records description page.